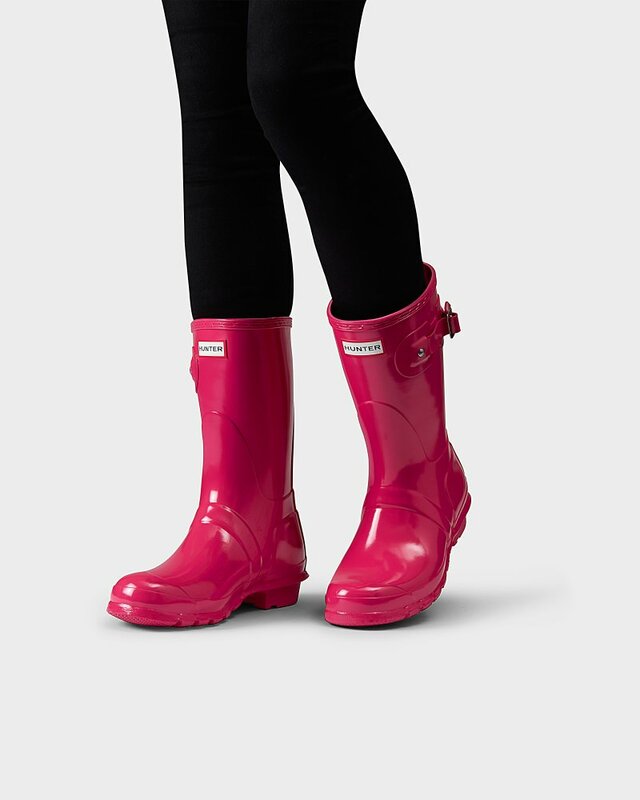 Women's Original Short Gloss Rain Boots is rated 4.3 out of 5 by 44. Parfaites pour les conditions humides, ces bottes Wellington pour femme sont plus basses que la botte montante classique Hunter Original. Faites en caoutchouc naturel, ces bottes nécessitent trois jours de fabrication et d'assemblage avant d'être vulcanisées pour encore plus de protection. Dotées du motif rainuré Hunter Original et d'une confortable doublure en polyester, ces bottes imperméables au fini brillant sont des chaussures indispensables pour les jours de pluie. Rated 5 out of 5 by Jessica87 from Love them I bought them because I’ve lost enough weight that I fit in them. I’m so in love with them. Will be ordering another pair real soon. Bonus they came really fast. Rated 1 out of 5 by Mama.Anti.Hunter from The boots react with the air?! I purchased a pair of glossy black boots which I wore for half of one rainy season before storing them away for the warmer months. When taking them out, I noticed one boot had turned a blue colour and the opening had expanded 1.5-2x. Reached out to Hunter who told me they react with the air and to purchase more of their products to fix this. I bought these products, and my boot is still blue. Dealing with their customer service has been a nightmare. For the money these boots cost I would expect more than a few months of wear and good customer service. Some “warranty” they are claiming come with these boots. Would never purchase another pair. Rated 5 out of 5 by The girl with the orange from Yay boots These boots are awesome!!! Would purchase again!!! Rated 2 out of 5 by Linda23 from A bit disappointed I was so excited to get the short violet gloss boots but am quite disappointed that the color looks more like a fuchsia rather than the violet shown on the website. Quite disappointing, especially considering how expensive they are. Rated 1 out of 5 by Nb123 from Didnt last I received these boots as a gift and they lasted one season and they started to crack and now they leak. They look great, but for what they cost I expected them to last longer. Very disappointed. Rated 4 out of 5 by Hollz from Bright In White I really like these boots, I already had the tall matte black so I wanted the shorter version in white. They fit much better if you have larger calves, they aren’t as tight and with the socks that you can purchase fit better. I ordered the matte white first but didn’t really like it as much so I exchanged for the gloss which are perfect. I had sized up but was way to big so I got my normal size. Rated 4 out of 5 by JMTO from First time buy So far so good! I bought these mostly for the winter wiht my hunter fleece liner and it’s pretty warm on cold days. Needed something stylish and easy on the feet. Loved the options of colours.